In Cleveland Nutrition I discovered a healthy lifestyle that has truly changed my life. I have been morbidly obese most of my adult life. At age 28 I was a whopping 366 pounds! I was accustomed to eating fast food three or four times per day. My excuse was that I was too busy to cook meals at home, as I typically worked 50 to 60 hours per week. 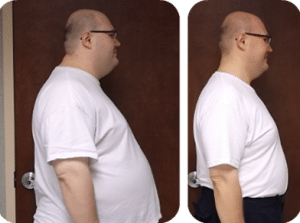 At 366 pounds I was suffering from obstructive sleep apnea, high blood pressure, high cholesterol, gout, hemorrhoids, shortness of breath and chest pains. I had difficulty walking even short distances and up flights of stairs. In addition to these physical troubles I suffered from anxiety, high stress, depression, and low self-esteem. I tried several diets to lose weight including Weight Watchers, The South Beach Diet, and The Biggest Loser Diet. On these diets I typically lost 20 – 30 pounds, but gained all the weight back within a couple of months. By age 32 I weighed 343 pounds and my gout attacks and hemorrhoid attacks were getting more frequent and more severe. I was seriously considering gastric bypass surgery as a solution. I felt worthless and ashamed of myself. That’s when I discovered Cleveland Nutrition. In my first consultation with Dr. Gutman we discussed my goals. I simply wanted to lose weight and get healthy to improve my quality of life. I determined that my first goal was to get below 300 pounds. Dr. Gutman assured me that if I diligently followed the Cleveland Nutrition program I would have no trouble reaching that goal. I had some serious doubts because I had tried dieting in the past with little success. My first week on the program I lost 13 pounds and I wasn’t even hungry! I ate full, healthy meals every day and I was amazed at how quickly I began to shed the weight. At the completion of the four month program I was down to 263 pounds – a total weight loss of 80 pounds and counting! Cleveland Nutrition works for me for many reasons. The educational component of this program has been truly eye opening. Through watching the online videos I have learned how food can help or hinder the human body, and how food promotes or inhibits typical diseases. The knowledge I have gained through the Cleveland Nutrition program is a powerful tool that I use daily to make healthy decisions. In addition, Dr. Gutman has provided me with a treasury of resources for use on the weight loss and wellness journey including a support group, a massive recipe database, and an online community just to name a few. I have found Dr. Gutman to be extremely knowledgeable and very caring and encouraging. Cleveland Nutrition is also a data driven program. Each time I weigh in, data is collected and charted on the computer showing my progress over time. Perhaps the most beneficial part of the Cleveland Nutrition program is that I get to interact with Dr. Gutman individually on a regular basis to ask questions and discuss various topics. Update: After 5 months I have lost a total of 100 pounds and I’m still losing weight! I am now completely pain free and off all of my prescription medications. My blood pressure and cholesterol are significantly lower. I now have increased energy, self-esteem and confidence. I now look forward to exercising and eating healthy each day.